c1904 photograph of a young man identified on reverse as Howard S. Taylor '04. 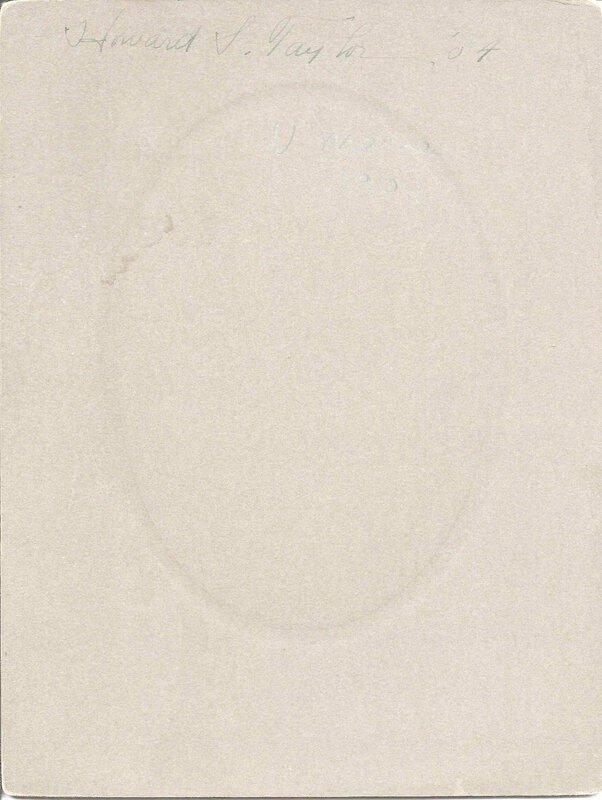 The photograph was taken by the Chalmers studio of Bangor, Maine. 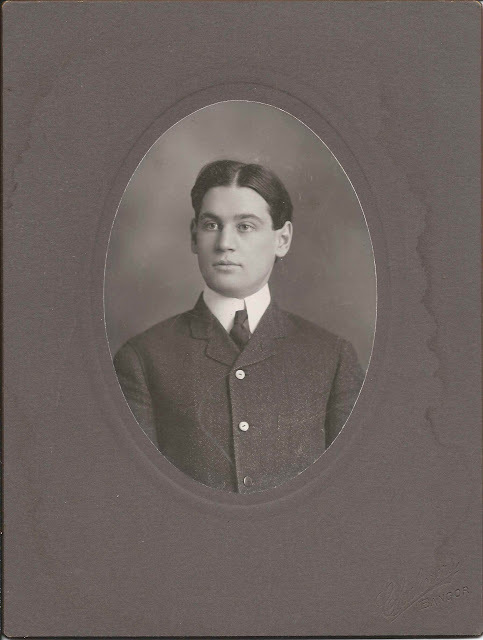 Howard Smith Taylor graduated from the University of Maine in 1904 with a degree in civil engineering. 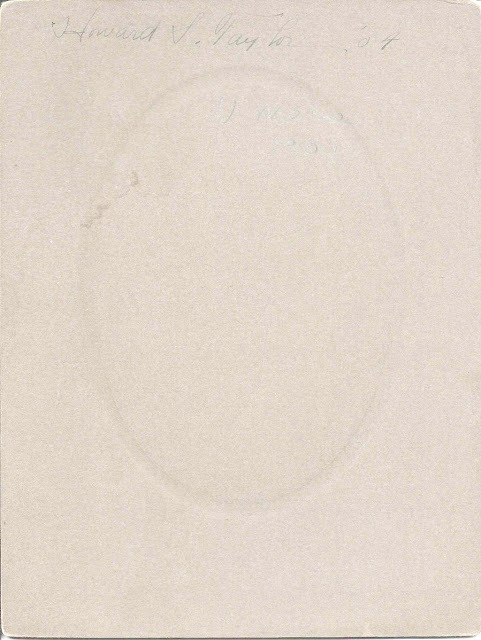 The reverse of the photograph, shown below, has been tweaked to highlight the handwritten identification. Howard Smith Taylor was born at Bangor, Maine, on 6 July 1881, the son of Frank and Emma Taylor, who were both Maine natives, according to Census data. After graduation in 1904, Howard left the State of Maine. At the time of the 1910 Census, he was working as a civil engineer and living at Montville, Connecticut, with wife Ethel, a New York native, and a newborn son. By 1920, the family, now increased to two sons, had moved to Van Buren, Ohio. They were still there at the time of the 1930 Census. Howard was still working as a civil engineer. Sometime before 1935, the family moved to Sarasota, Florida, where they are listed in the 1935 Florida State Census. The sons had moved out by this time. Howard was still working as an engineer. He and Ethel are still at Sarasota by the time of the 1945 Florida State Census, and Howard was working as a consulting engineer. If you have corrections to the above, or further information on Howard Smith Taylor and his parents and ancestors, please leave a comment or contact me directly. Thanks! I believe I am the great-grandson of Howard Taylor. Are you also a descendent of Mr. Taylor? May I ask how you found out the information about him? If you're interested I have a family tree I can share. I am the granddaughter of Howard Smith Taylor. Frank Howard Taylor, HST's first born son, is my father. I'm looking for Frank's brother Ralph Carr Taylor, born in 1913 or 14. Is Ralph your grandfather? Thanks for your comment, Don. My information comes from online, warts and all. If you notice things that need correcting, please leave another comment, and I will gladly amend the post. Again, thanks!